Today I try to show you a very interesting flowers making idea. Of course its made by paper. Its called paper flower. Today’s paper flower name is #Daffodils #Flowers. You know daffodils paper flowers are one of the best view in youtube. If you search the keyword on youtube even google then you will get hundreds of daffodils paper flower tutorial video. And million of article how to make that. But Why I also make this flower, even more competition. Yes that is the question. Lets read the article below to describe you. 1. I love to making paper flower. And its my passion. You will be notice that my channel name is #linascraftclub Its a club of making craft video. That is a great matter behind making this video. 2. Daffodils paper flowers have lots of competition. But if you compare between paper flower and viewers then video content is still low than the viewers. I want to make my videos a million views. Its depend on the viewers choice. each viewers have their own choice. I have not any statistics that I get what the most viewers like. So I need to make this paper flower. 3. Daffodils paper flower is very easy to make. Anyone can make it after watching first time. And I make the video tutorial normally so that anyone can learn it. If you watch my video fully then you can make it easily. 4. I have a intention to show my creativity to whole world. I’m starting level and I do hard working behind my channel. I am completed my 1 year experience. And I want to go beyond. For that I need make videos on my niece. 5. My viewers support me, So I make paper flower video for them. All I do by my camera, computer and my own brain. I’m not expert in marketing. But I try to hard to do that. And I expect I can gain more views in this time. But lack of marketing knowledge its brea my ranking. I want to make more videos, more and more. That is all matter I make this video. I love to making paper flower. Whatever you call origami paper flower. Its my passion and I like to do it. 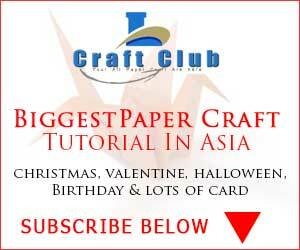 Last day I make another paper craft videos, its stick paper flower you can watch it here.